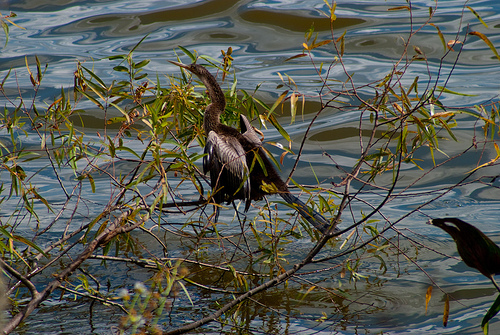 Surfacing from their dives to chase fish, anhingas, with their long-necked heads, look like snakes at attention, which is why the anhinga is also called the snakebird, or water turkey. After dining their fill, they retreat to the limbs of trees or shrubs along the water’s edge, stretching out their wings to dry. Just viewed one in my backyard pond. It appears to be sneaking up on something.